The problem is that server never validates the certificate and fails with the above error. Does anyone have any idea of what should I do? I should mention that a colleague and I performed tests a few weeks ago and it was working fine with something similar to what I wrote above. The only "major difference" we've found is that I'm using Windows 7 and he was using Windows XP. Does that change something? And now, it works perfectly. As mentioned by Robin French; if you are getting this problem while configuring PayPal, please note that they won't support SSL3 starting by December, 3rd 2018. You'll need to use TLS. Here's Paypal page about it. Make sure the ServicePointManager settings are made before the HttpWebRequest is created, else it will not work. The error is generic and there are many reasons why the SSL/TLS negotiation may fail. The most common is an invalid or expired server certificate, and you took care of that by providing your own server certificate validation hook, but is not necessarily the only reason. The server may require mutual authentication, it may be configured with a suites of ciphers not supported by your client, it may have a time drift too big for the handshake to succeed and many more reasons. The best solution is to use the SChannel troubleshooting tools set. SChannel is the SSPI provider responsible for SSL and TLS and your client will use it for the handshake. 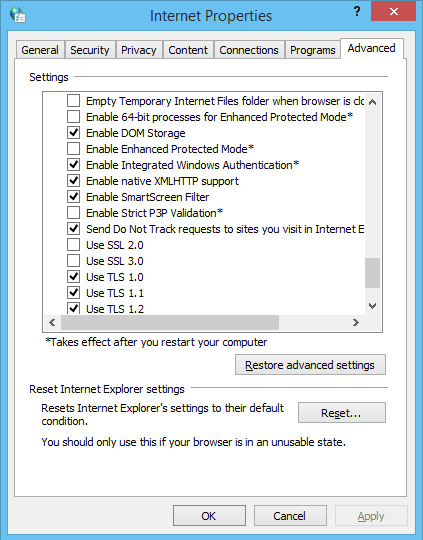 Take a look at TLS/SSL Tools and Settings. Also see How to enable Schannel event logging. I had this problem trying to hit https://ct.mob0.com/Styles/Fun.png, which is an image distributed by CloudFlare on it's CDN that supports crazy stuff like SPDY and weird redirect SSL certs. After many long hours with this same issue I found that the ASP.NET account the client service was running under didn't have access to the certificate. I fixed it by going into the IIS Application Pool that the web app runs under, going into Advanced Settings, and changing the Identity to the LocalSystem account from NetworkService. A better solution is to get the certificate working with the default NetworkService account but this works for quick functional testing. Something the original answer didn't have. I added some more code to make it bullet proof. 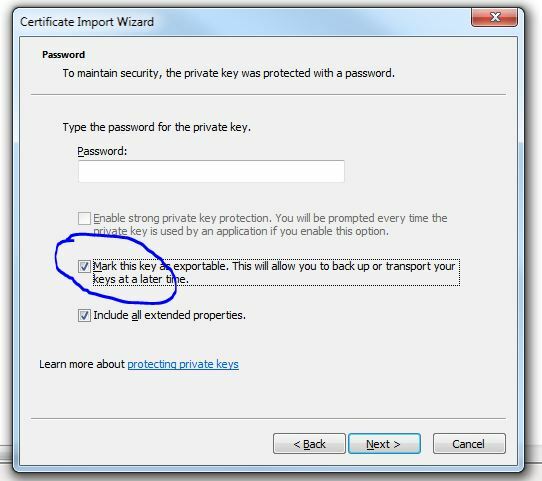 Another possibility is improper certificate importation on the box. Make sure to select encircled check box. Initially I didn't do it, so code was either timing out or throwing same exception as private key could not be located. The "The request was aborted: Could not create SSL/TLS secure channel" exception can occur if the server is returning an HTTP 401 Unauthorized response to the HTTP request. You can determine if this is happening by turning on trace-level System.Net logging for your client application, as described in this answer. System.Net Information: 0 :  Connection#62912200 - Received status line: Version=1.1, StatusCode=401, StatusDescription=Unauthorized. In my situation, I was failing to set a particular cookie that the server was expecting, leading to the server responding to the request with the 401 error, which in turn led to the "Could not create SSL/TLS secure channel" exception. If you set the value of WebRequest.Timeout to 0, this is the exception that is thrown. Below is the code I had... (Except instead of a hard-coded 0 for the timeout value, I had a parameter which was inadvertently set to 0). This is really bad. Not only is it instructing .NET to use an insecure protocol, but this impacts every new WebClient (and similar) request made afterward within your appdomain. (Note that incoming web requests are unaffected in your ASP.NET app, but new WebClient requests, such as to talk to an external web service, are). This is a global setting in your appdomain, and if you have concurrent activity, you can't reliably set it to one value, do your action, and then set it back. Another action may take place during that small window and be impacted. The correct setting is to leave it default. This allows .NET to continue to use whatever is the most secure default value as time goes on and you upgrade frameworks. Setting it to TLS12 (which is the most secure as of this writing) will work now but in 5 years may start causing mysterious problems. I have struggled with this problem all day. When I created a new project with .NET 4.5 I finally got it to work. But if I downgraded to 4.0 I got the same problem again, and it was irreversable for that project (even when i tried to upgrade to 4.5 again). Another possible cause of the The request was aborted: Could not create SSL/TLS secure channel error is a mismatch between your client PC's configured cipher_suites values, and the values that the server is configured as being willing and able to accept. In this case, when your client sends the list of cipher_suites values that it is able to accept in its initial SSL handshaking/negotiation "Client Hello" message, the server sees that none of the provided values are acceptable, and may return an "Alert" response instead of proceeding to the "Server Hello" step of the SSL handshake. To investigate this possibility, you can download Microsoft Message Analyzer, and use it to run a trace on the SSL negotiation that occurs when you try and fail to establish an HTTPS connection to the server (in your C# app). If you are able to make a successful HTTPS connection from another environment (e.g. the Windows XP machine that you mentioned -- or possibly by hitting the HTTPS URL in a non-Microsoft browser that doesn't use the OS's cipher suite settings, such as Chrome or Firefox), run another Message Analyzer trace in that environment to capture what happens when the SSL negotiation succeeds. Hopefully, you'll see some difference between the two Client Hello messages that will allow you to pinpoint exactly what about the failing SSL negotiation is causing it to fail. Then you should be able to make configuration changes to Windows that will allow it to succeed. IISCrypto is a great tool to use for this (even for client PCs, despite the "IIS" name). In case that the client is a windows machine, a possible reason could be that the tls or ssl protocol required by the service is not activated. If you are running your code from Visual Studio, try running Visual Studio as administrator. Fixed the issue for me. I was having this same issue and found this answer worked properly for me. The key is 3072. This link provides the details on the '3072' fix. In our case, we where using a software vendor so we didn't have access to modify the .NET code. Apparently .NET 4 won't use TLS v 1.2 unless there is a change. The fix for us was adding the SchUseStrongCrypto key to the registry. You can copy/paste the below code into a text file with the .reg extension and execute it. It served as our "patch" to the problem. The issue for me was that I was trying to deploy on IIS as a web service, I installed the certificate on the server, but the user that runs IIS didn't have the correct permissions on the certificate. This question can have many answers since it about a generic error message. We ran into this issue on some of our servers, but not our development machines. After pulling out most of our hair, we found it was a Microsoft bug. Essentially, MS assumes you want weaker encryption, but the OS is patched to only allow TLS 1.2, so you receive the dreaded "The request was aborted: Could not create SSL/TLS secure channel." 2) Add a setting to your app.config/web.config file. 3) Add a registry setting that was already mentioned in another answer. All of these are mentioned in the knowledge base article I posted. You can try to install a demo certificate (some ssl providers offers them for free for a month) to be sure if the problem is related to cert validity or not. As long as this is a relatively "live" link I thought I would add a new option. That possibility is that the service is no longer supporting SSL 3.0 due to the problem with the Poodle attack. Check out the Google statement on this. I encountered this problem with several web services at once and realized something had to be going on. I switched to TLS 1.2 and everything is working again. This was happening for me on just one site, and it turns out that it only had the RC4 cipher available. In a prior effort to harden the server, I had disabled the RC4 cipher, once I re-enabled this the issue was solved. In addition to the answers above, make sure you have imported the CER cert, and NOT the PFX file into your local machine store. A common mistake when you have both files. In my case I had this problem when a Windows service tried to connected to a web service. Looking in Windows events finally I found a error code. The following fatal alert was generated: 40. The internal error state is 808. The proposed solution in vmware forum was add a registry entry in windows. After adding the following registry all works fine. Apparently it's related with a missing value in the https handshake in the client side. Not the answer you're looking for? Browse other questions tagged c# asp.net windows-8 windows-7 httpwebrequest or ask your own question. Could not create SSL/TLS secure channel - Could the problem be a proxy server?